Birch Branch is home of the Birch Branch Card and Photo Tree Stand. We came up with this idea out of the need to display our large amount of Christmas Cards in an organized and beautiful way. We know many families such as ours take the time to make beautiful holiday cards and have no practical way to display them. 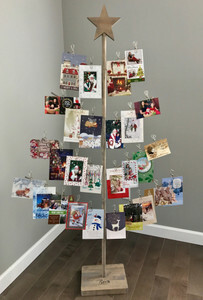 This 6 foot tall, free standing card stand allows you to display you entire collection of holiday cards or birthday cards on one convenient stand. It's easy to assemble and disassemble, comes with 30 stainless steel clips, and a portable carrying case / storage case. The stand itself is made of solid birch wood and comes available in three beautifully stained colors: Weathered Grey, Whitewash, and Rustic Brown. Our stained colors provide a beautiful color while allowing the gorgeous grain of the birch wood to come through. It's built to last and can be used all year round. You can put the heart topper on and use it for a photo display and create a photo family tree or use it for you children's artwork. You can also put the gift topper on it and use it for your family's birthdays. It's also perfect for a wedding card holder and can be used for wedding showers, bridal showers, or baby showers. You can even use it as a place card holder for seating arrangements at showers or weddings. When someone enters the special occasion they can grab their assigned seats right off the card stand. It can also serve as a picture holder or picture tree during a special occasion. You will not be disappointed by the quality of this product and we can assure you that it will be one of the most practical items in your home. We also offer a variety of new toppers to correspond to your special event, day, or occasion.